I was in desperate need of a desk, a place to write, to be my own space. Sitting on the sofa mid-chaos wouldn’t work anymore. 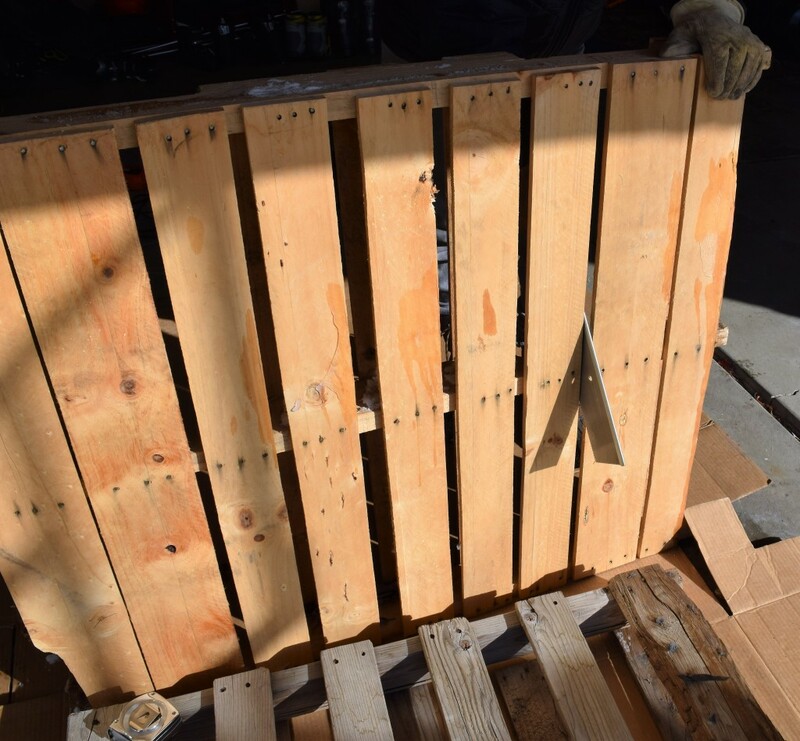 At some point I had picked up a couple free pallets, so I started hunting Pinterest for some inspiration. I had been cautioned by my dad (a veteran wood-worker) that pallets are very difficult to work with. 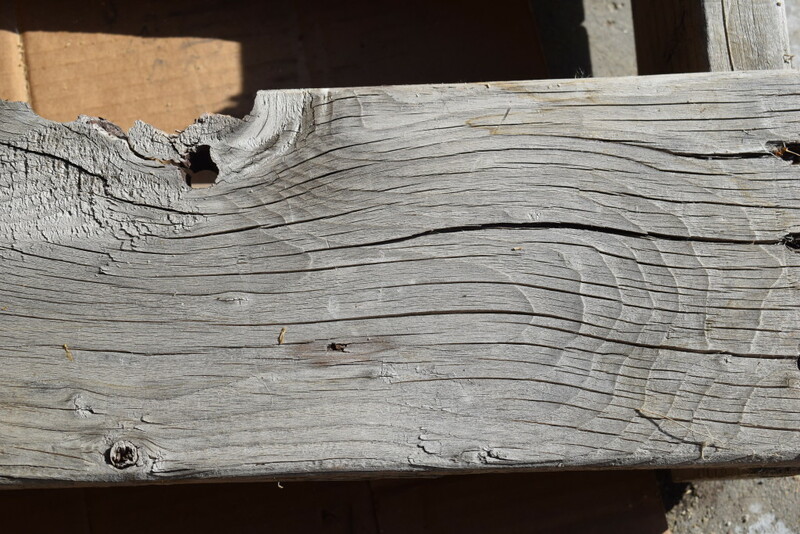 They are “too hard, too rough, the grain is too stringy to nail.” He gave me some tips on the various pins I liked and suggested picking up fresh lumber. 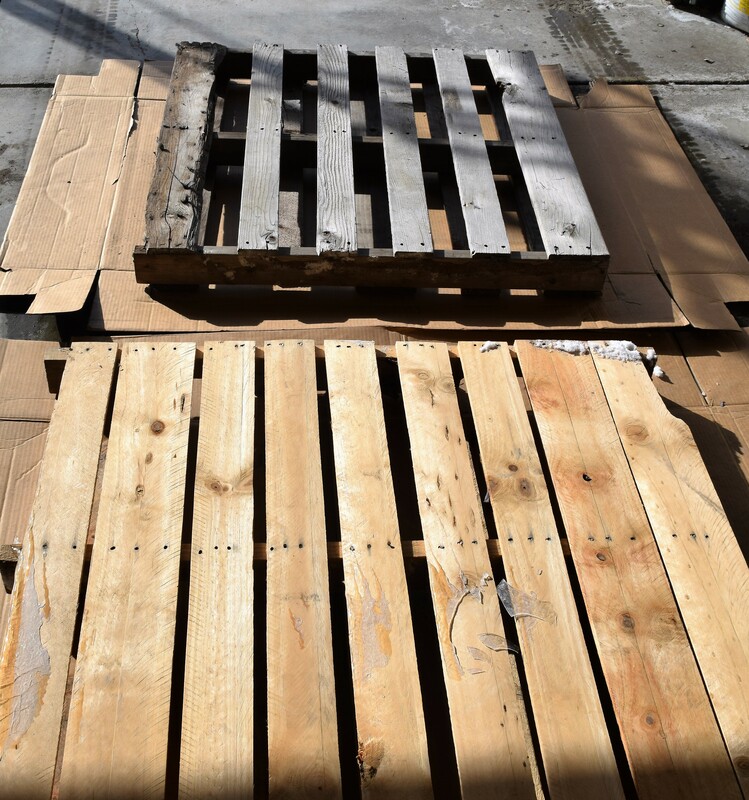 Hating to waste what I had lying around…I thought I’d try out the pallets first. We started with two different colored pallets, gray and blonde. If they were both the same color, it may have been prettier unpainted, so keep that in mind if it’s your goal. Wear work gloves or your hands will be covered in splinters! Getting these apart and usable is the toughest part. 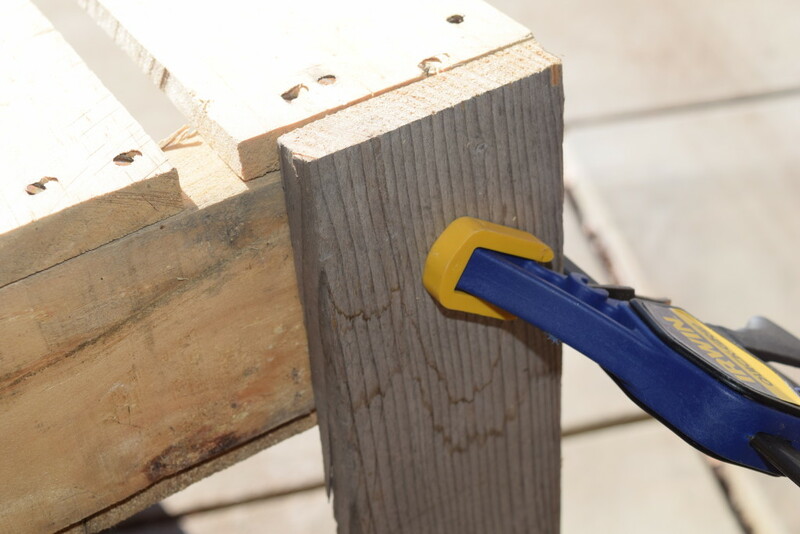 Before you start cutting or even pulling them apart, have an idea the lengths you will need. They are such a bear to disassemble you’d hate to do it wrong! First, decide how big you would like your desktop to be. 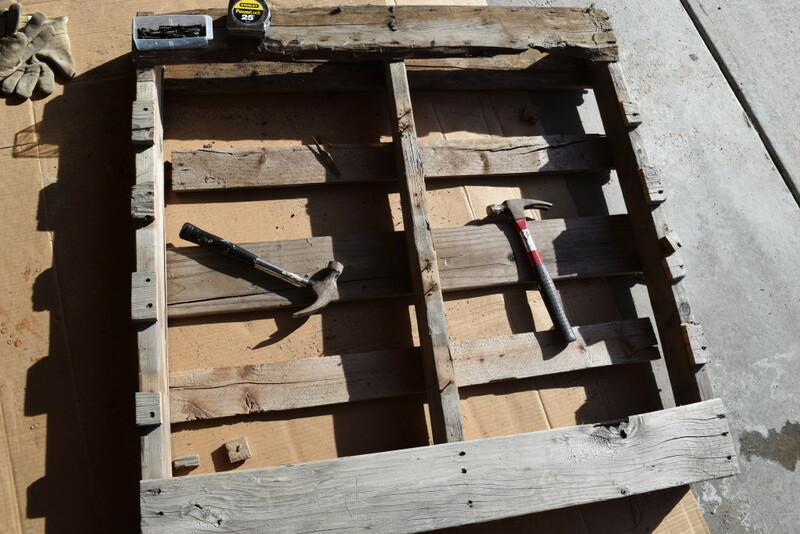 Mine was about 40″ x 24″ so we had to cut off a small part of the pallet. 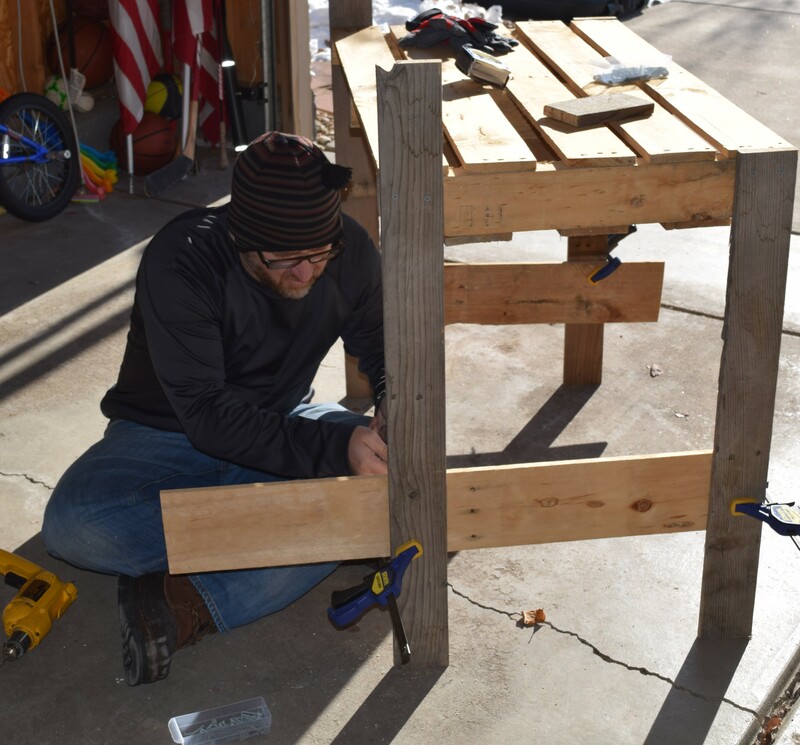 Next you will need to cut along the sides of the other pallet for the boards to construct the legs, etc. Cutting along the sides will still leave the boards nailed to the middle. Be careful prying these off. The boards can split if they are dry or brittle. We used the claw part of hammers to remove them but I think I crowbar would work much better. I hope you have one handy! If not, be patient. Don’t break the boards! 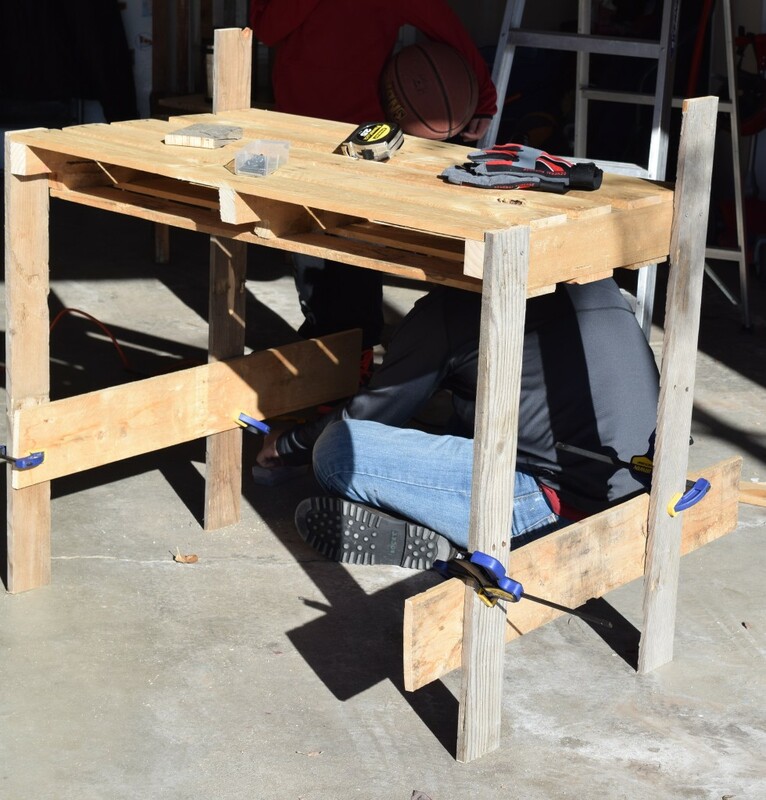 Clamp on the legs and decide on the height. One board was especially interesting so we thought the desk should have a little shelf. After deciding on the desk height, cut off the leg boards. If you want a shelf leave the back legs a bit longer. 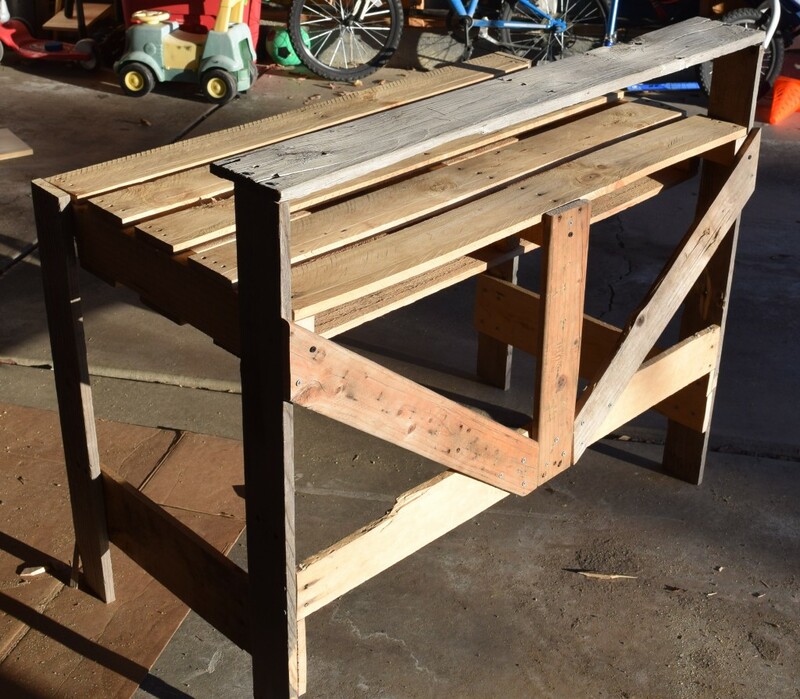 To make it sturdy, add diagonal boards. Attach your shelf. This wood is incredibly rough so you will need to sand it quite a bit. I originally planned to “white wash” it then rub a gray stain over it. 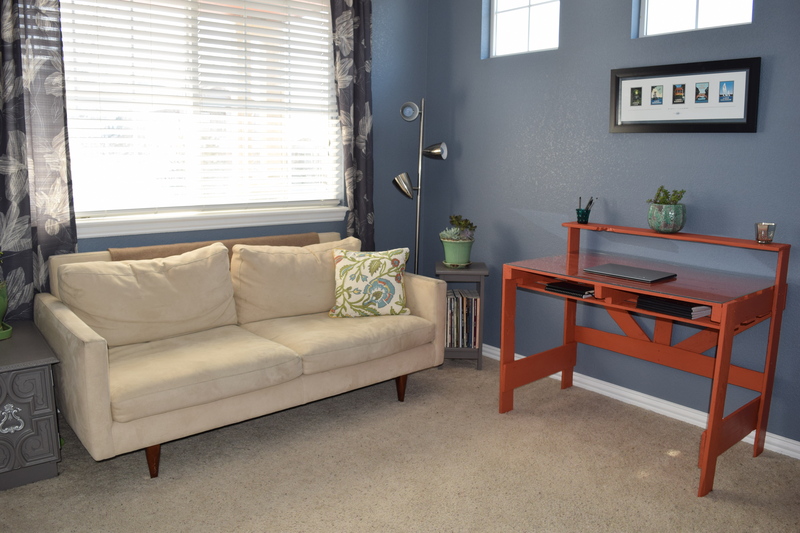 However, it was going into a room that is mostly cream and bluish-gray. A friend suggested persimmon which is a fancy word for orange. I was a little nervous, but it turned out fun! 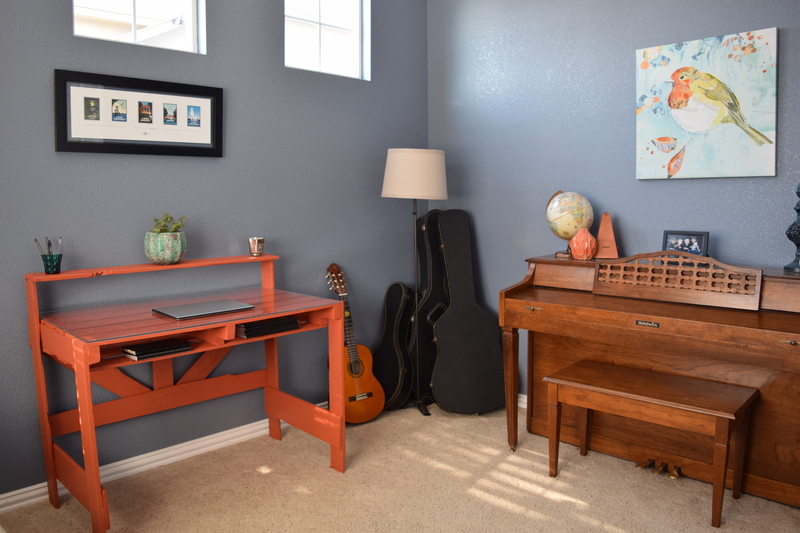 We call this our “Music Room” and it’s where guitar or piano can be practiced behind a closed door…we had a lot of problems with little brothers interfering during lessons in our previous home. It’s also a quiet place to escape in our world of chaos and mayhem. In the corner is a gray cabinet that hides the cat’s litter box. If interested in how to make this, click here. Since I can’t write on the slats on top, I picked up a piece of Plexiglas. I wanted the thick kind so it wouldn’t budge, but it was a bit more expensive than I’d hoped. Take a look at your local hardware store for some…mine was $60. Ouch. The paint was only $15 for the quart and I only put on one coat since it was a paint/primer combo. Total $75 and about 5 hours of my time. I hope to find something to slide in and make drawers, but you will see notebooks in there for now. Good luck! Creative natUre, it looks like a good additon to your room. Still a great price as well! This is excellent! Although it might be DIO (do it ourselves)…I think I spied someone else in the picture. 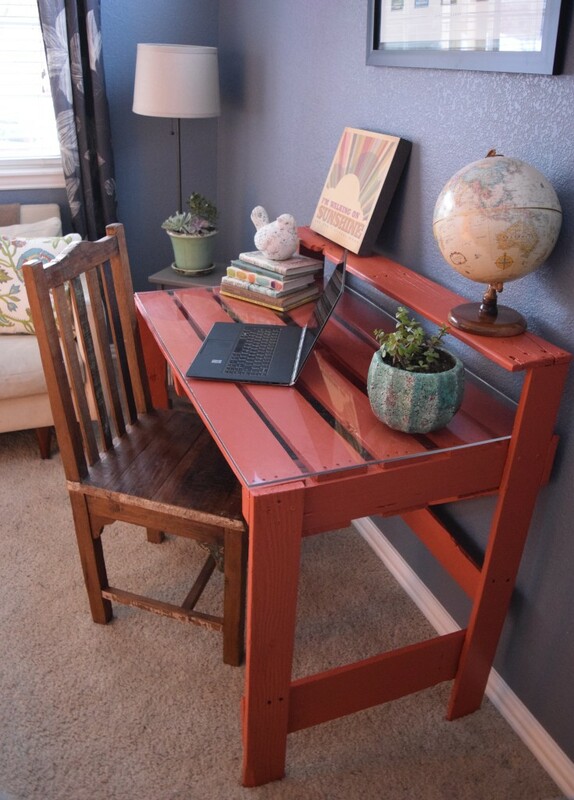 I thoroughly love anything to do with repurposing pallets. 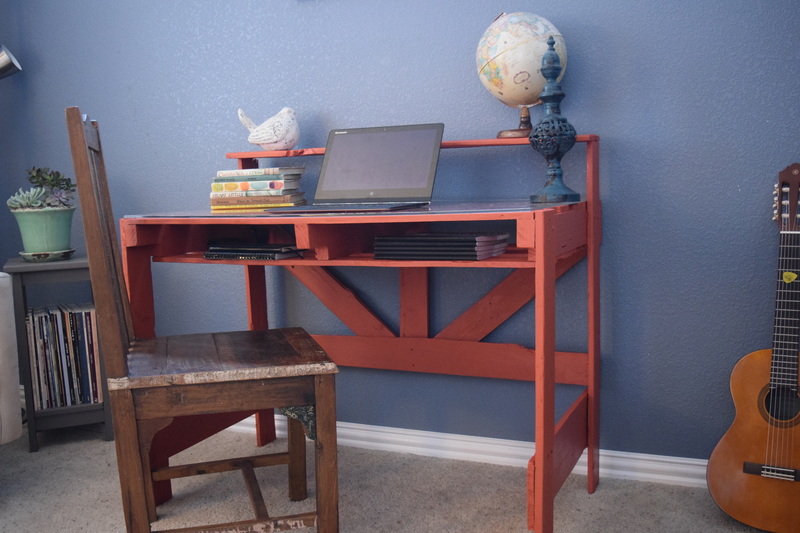 This desk especially is a great success! This is amazing! 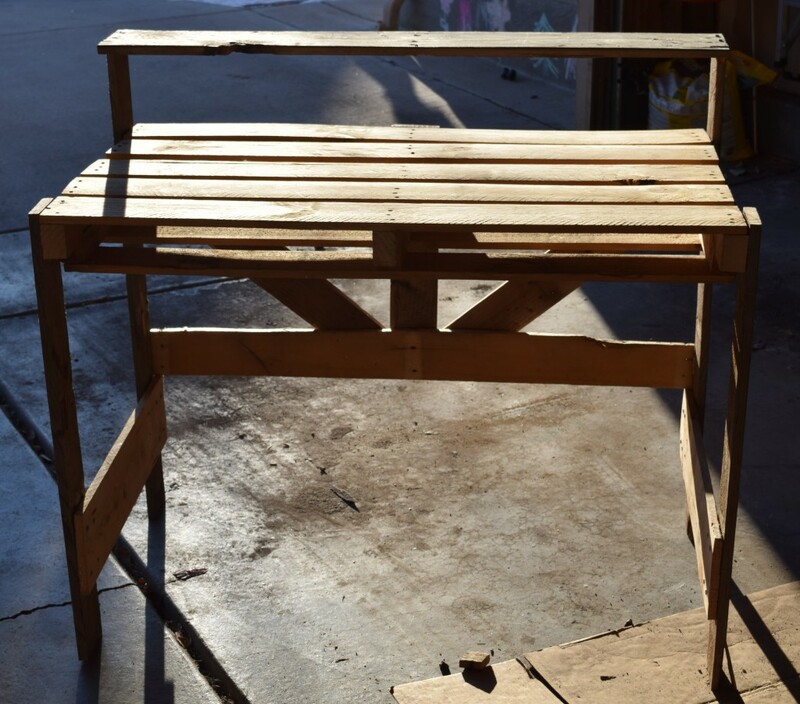 I am obsessed with pallet furniture! I’m too scared to try to build anything myself, I don’t know the first thing about tools outside of an allen wrench for my Target Furniture or retail displays. I love to look at what the creative minds of others come up with though! Really interesting article! Congrats on a well-done product that useful! I love the way this came out. 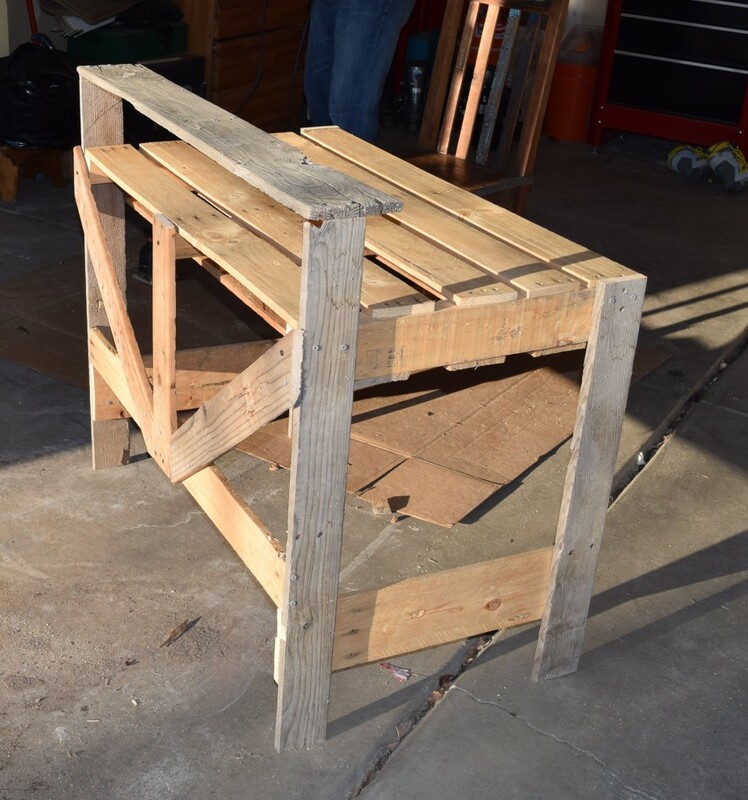 I would not be the one to do this project, but I have a husband who could do it and would have the patience to deal with the pallets. I love the color you chose and it looks great in your music room. It looks great! Well done! I’ve never tried anything like this.